Thicket-forming evergreen shrub or small tree; 10-14 feet high. Leaves are large, leathery, without teeth; edges rolled under. Rose-pink (white) spotted flowers in very showy clusters; June to July. 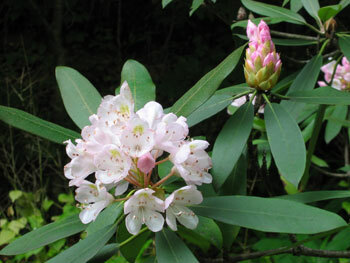 Easily confused with mountain laurel. Damp woods. Southern Maine to Georgia; Alabama to Ohio. Native Americans poulticed leaves to relieve arthritis pain, headaches; taken internally in controlled dosage for heart ailments. Leaves are toxic. Ingestion may cause convulsions and coma. Avoid use or use only with medical supervision.